Weighty Matters: Burger King - Stricter Nutritional Criteria than Health Check! Burger King - Stricter Nutritional Criteria than Health Check! Doesn't sound particularly healthy to me. 560 calories is still more than a child should consume in a single meal. 600mg of sodium is half a day's worth. The calories from fat and saturated fat stuff I don't care too much about. No trans fats - seems like a no brainer. I was pleased however to see the no more than 10% of calories from added sugars as that's the World Health Organization's recommendation. So basically it's a bit of healthier window dressing but certainly nothing brag worthy. Nothing brag worthy unless of course you're comparing Burger King's new guidelines with those of the Heart and Stroke Foundation's awful misinformation program Health Check. What does Health Check have to say about restaurant kids' meals? 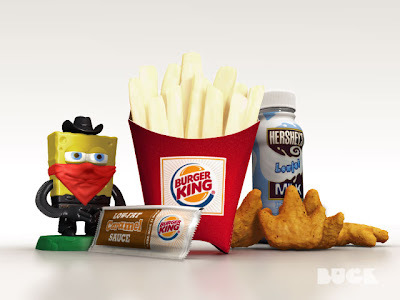 Man, if I was the marketing director of Burger King's brand I'd be all over this as for those keeping score, compared with Burger King's, Health Check's kids' meals allow for unlimited calories, ignore added sugar, allow for a whopping amount of trans-fat and allow for 20% more sodium. So should we be cheering for Burger King? I'm not. Ultimately this is just smoke and mirrors as their new dramatically stricter than Health Check but still weak nutritional criteria only apply to their "advertised" kids meals and likely is just another ploy to appease parents and try to steer governments away from considering regulations. Interesting too that a day after the announcement the media was all over it and rightly pointed out the hollowness of Burger King's pledge. What a shame the media doesn't hold Health Check and the Heart and Stroke Foundation up to the same degree of scrutiny.